Tortuga Music Festival brings like-minded fans together for an unforgettable beach weekend experience that pairs music with meaning to raise awareness for marine conservation. 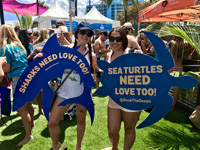 Tortuga Music Festival works hand in hand with the Rock The Ocean Foundation to increase public awareness about the issues impacting the world’s oceans and to support scientific research, education, and ocean conservation initiatives. In 2018, we’re taking this to the next level by committing to reduce the environmental impact of the festival, with a focus on issues impacting the health of our oceans. Efforts include a comprehensive recycling program, eliminating single use plastic water bottles, and a food menu curated with responsible food sourcing practices top of mind. By using this site to order your food service ware, you will rest easy knowing you are in 100% compliance with festival guidelines, put in place to help us reduce our festival environmental footprint. We thank you for doing your part to help Tortuga Music Festival reduce waste!